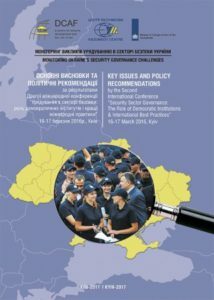 This publication offers the Key Issues and Policy Recommendations based on the results of the Second International Conference “Security Sector Governance: The Role of Democratic Institutions & International Best Practices”, held 16-17 March 2016, in Kiev. This publication offers the Key Issues and Policy Recommendations based on the results of the Second International Conference “Security Sector Governance: The Role of Democratic Institutions & International Best Practices”. Conference Two, following to the first conference recommendations, sought to examine current Ukraine’s security sector governance challenges by highlighting the role of democratic institutions and the international best practices.